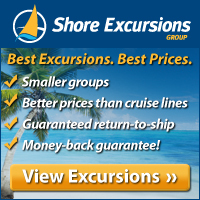 There are multiple ways to book your shore excursions for your upcoming vacation. Some prefer to book directly through the cruise line, while others prefer to shop around for the best deals and use a third party vendor. Bon Voyage Cruises has partnered with a member of our trusted consortium, Shore Excursions Group, to offer shore excursions at a discounted rate. Shore Excursions Group offers Guaranteed Return to the Ship, Lower Prices than Cruise Lines, Money-back Guarantee, Guaranteed Departures, Higher Quality - Smaller Tours and more. Please note, Shore Excursions Group is a third party vendor and is not affiliated with any cruise line.